The twelfth (12) kickstarter from Fail Squad Games has just launched. 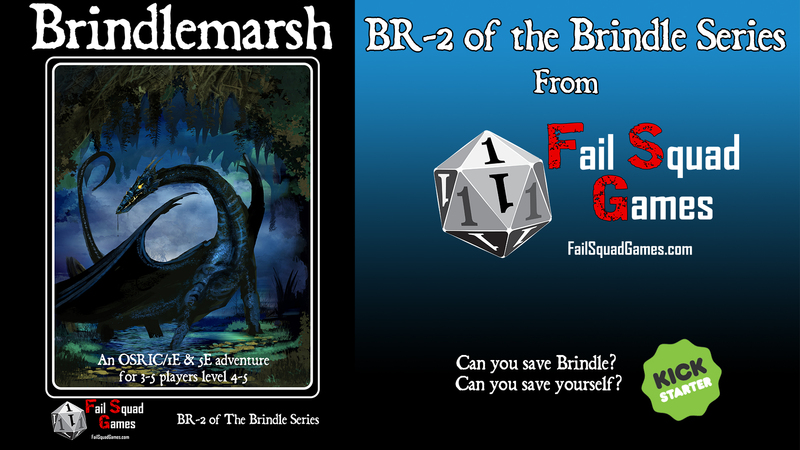 Brindlemarsh is the continuation of the Brindle series of adventures. Bogey of Brindle (BR-1) is alaso available through the project or on the website. We’ve added some unique magic items, cool collectibles and an exciting adventure for your heroes! Written by Lloyd Metcalf and Ric Martens, edited by G.Scott Swift, this new adventure will be a great addition to your tavern tales of adventure. Dwarfhome stones (created from cockatrice eggs) are one of the new magic items in Brnidlemarsh. The basic module adventure is just $10 to support FSG and help us to go print. $5 for PDF!! Get in now many limited levels.